Some people listen to the music more than the words and for some people, understanding the lyrics to a song is key. What do you pay attention to when you listen to songs? Let me know by leaving a comment! Did you know that all the lyrics to my songs are available on CatherinesMusic.com? 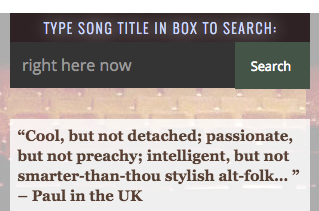 Just click here and type the song title into the search field in the upper right-hand corner, then click “search” and the song will come up for you with the lyrics. If there is something missing, or if you have any issues with my website, please contact me and let me know – thanks! @PabloSquared – yeah, it's one of my favorite descriptions, thank you for writing it! and for the RT. Much gratitude for you, Paul! It’s all about the lyrics–the poetry– the meaning of the song. I learned this when I first “discovered” Bob Dylan around 1965. I discovered him listening to The Byrds version of “Mr. Tambourine Man” on the two big AM stations in the New York area–WMCA and WABC. Without good lyrics that the listener can somehow relate to, the song is just one of millions; the words make it one of one. Thanks, Bill! Dylan is one of the greatest songwriters of all time, IMHO. I think that’s why so many songwriters cover his songs, to tap into that genius he has for writing great lyrics. If you like Dylan, you might also enjoy Ray LaMontagne – great lyrics and what a voice to carry them with! Despite a background in literature, writing, and editing, I listen first to the music, the changes, intervals, and especially the bass. However, in some songs, the lyrics are more central, more poetic, easier to hear (your song “Nothing’s Wrong” is an example), I’ll hear and follow the lyrics. But I think it’s all music: the rhythm, flow, and musicality of the words is one of the strands that make it music, and in different songs, different strands are prominent. Thanks, Ed! I didn’t know that in addition to your experience and talent as a photographer, you also have a background in working with words. I agree, the lyrics are also the music – for me, it is very important for my lyrics to be prosodic, that is, flow like speech so that they are also musical.